Moongate Gardens - do you know of more? Another rainy day in wintery Britain made me think and reflect on some of the more unusual garden features I've seen during the course of my "galloping" in the last couple of years and I realised that one such feature was the "Moongate" you occasionally encounter. Big thanks are due here to Diana of Elephants Eye who commented on a recent blog entry and told me the name of this feature. 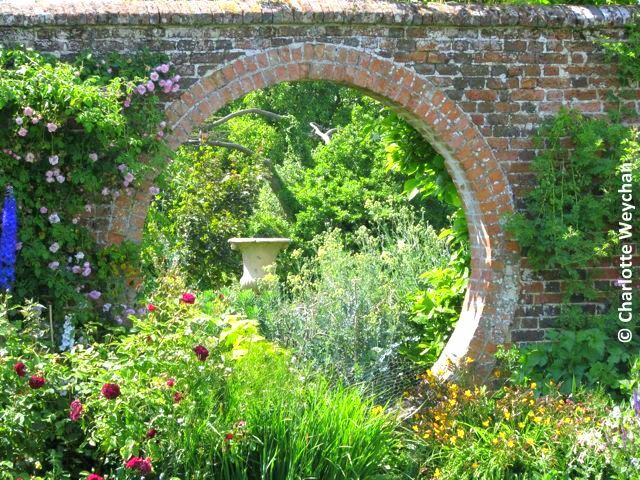 I have to confess that prior to my enlightenment, I just thought of it as a hole in wall found in English gardens! I've tried to research the origin of moongates, but come up with little more information than this feature having its origins in China, and that it's "a circular passageway found in Chinese, Japanese and Bermudian architecture". But it's obviously a landscape architecture feature of British gardening too. 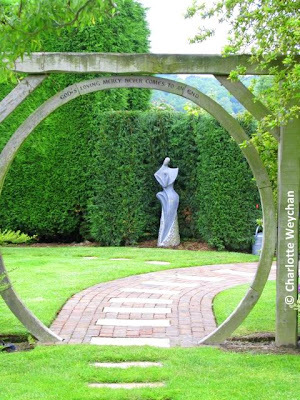 Jan Johnsen also featured a moongate on her blog - Serenity in the Garden - last year, when writing about Naumkeag in Massachussets, and you can see what she has to say by clicking on the link. The only other reference I could find was to a silver gilt medal winner at the RHS Tatton Flower Show in July of 2004, where a moongate was featured in a Japanese garden and another winning show garden - "Through the Moongate" designed by Lesley Bremness for Chelsea in 2007 - which won a bronze award. 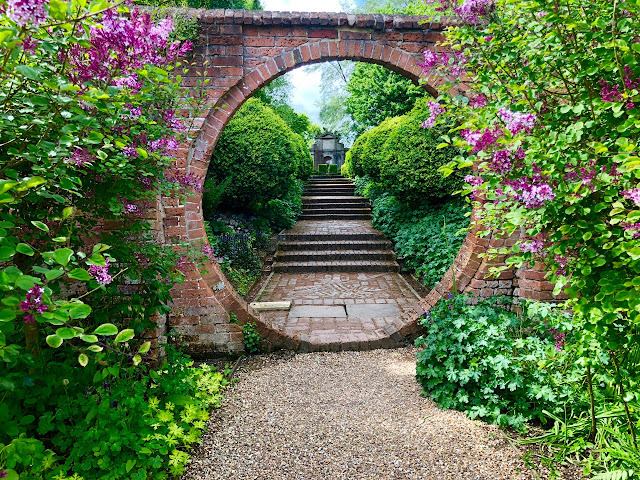 Notable gardens in Britain that have moongates are Claydon House in Buckinghamshire (top), the magical gardens at West Green House; Great Comp in Kent; the Lake House in Hampshire (below) and Latchetts in West Sussex, which both open for the National Gardens Scheme in 2011. Check their website (listed in Notes to Fellow Bloggers on right) for details. 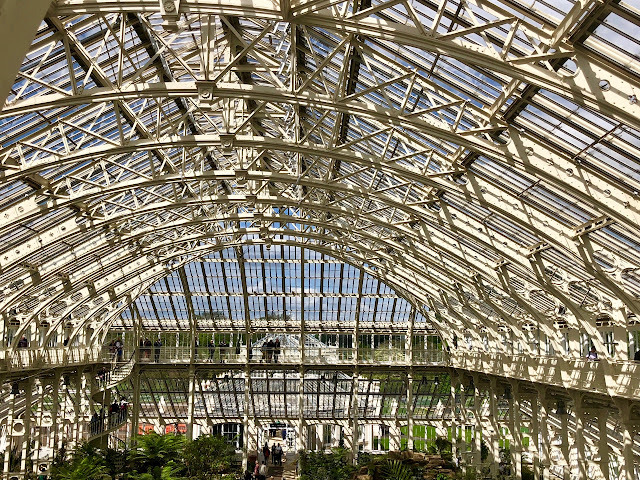 The really good news is that West Green House is re-opening its doors to the public this year on a regular basis throughout the season on Wednesdays, Saturdays and Sundays from 23 April to 18 September. This is Marilyn Abbott's glorious garden - an absolute must see at any time during the season, but particularly spectacular when the tulips (15,000 bulbs planted annually) or alliums are in bloom. The moongate here gives a wonderful view over the garden in bloom, or the vista beyond, depending on which side of it you're standing. One of the most unusual gardens in Britain is The World Garden at Lullingstone Castle in Kent - home of Tom Hart Dyke, modern-day plant hunter who was kidnapped by South American guerillas while searching for orchids in Panama in 2005. During his captivity, which lasted nearly nine months, he dreamed up the idea of an international garden, showcasing plants from all over the world and divided into continents. 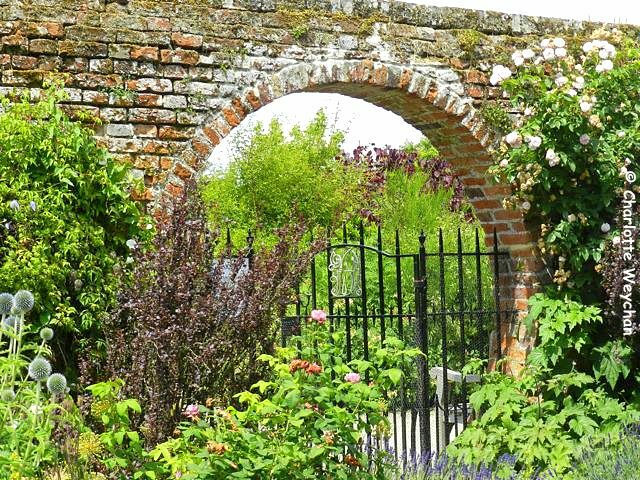 His vision became reality after his release and he has created an amazing garden within the former walled kitchen garden at his ancestral home in Kent. But moongates don't stop at ancient structures like most of those above. 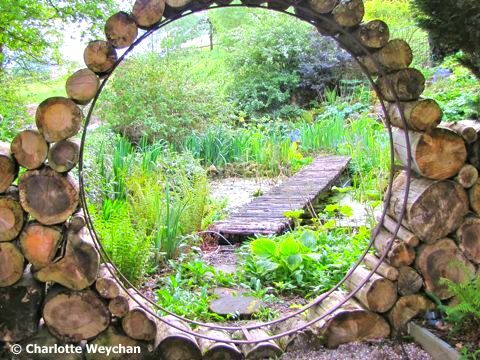 The owners of Austwick Hall in Yorkshire, have designed and built their own contemporary moongate in their astounding garden! I was so impressed by what they've done, that I've asked them to design and install a similar gate at my own garden in Sussex, so watch this space and you may well see my own moongate soon! As I visit more gardens, I will continue to add to this list of moongates, but if you know of other gardens with these wonderful picture windows, please leave a comment. Hmm... I have seen the garden in the first photo before, I am sure... it's a bit wonderful, I would love to have my own moongate. I don't know of any myself, perhaps moongating is not so popular in Australia? Perhaps I could start a trend? What are the rules for the moongate, do you know? I remember seeing a lot of moongates in gardens in Bermuda so when they appeared in your blog I knew exactly what they were. As I recall, they were a common garden feature, not something reserved for great estates or public gardens. Here is a list of 9 moongate locations with photos: http://www.jillhenry.com/PDF/moongate_booklet_new.pdf. Have fun. The entrance to the Japanese Garden at Atlanta Botanical Garden is through such a gate...it's a wonderful mood setter. Wow. Just awesome...now I want a moongate! Beautiful, Charlotte, just beautiful. Blithewold has a moongate to their rose garden. Charlotte, the moongate that I can instantly recall is the one at Leith Hall in Scotland. http://www.gardenvisit.com/garden/leith_hall_garden has a picture of it. We visited one cold April day a good few years ago but I would like to go back in summer. This garden has a beautiful rock garden but the other outstanding feature I remember is a zig-zag herbaceous border either side of the main path. It was just a selection of dead plants with a red tulips in clumps all the way up, in April, with the zig-zag marked by the path. I was really taken with this and can imagine how usual and beautiful it must look in full flower. This is both a historic and modern garden with some lovely features. I just visit your blog for the first time and I'm impressed and (hard to find my words in english) really happy to discover it ! You have beautiful pictures. Thanks to share them. I wish you a happy new year with a lot of travels. I just love moon gates! How fun. Of course, beautiful photos. I feel transported. Thank you. There's a moongate as the entrance to The World Garden at Lullingstone Castle which is in the old walled garden of the estate. 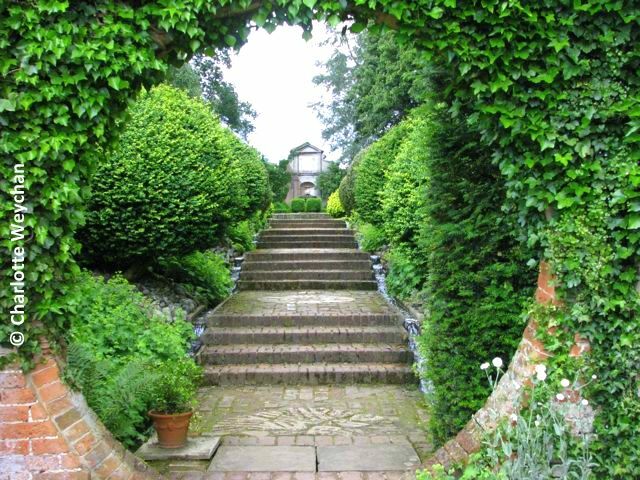 They are quite magical as they frame the entrqance to any garden beautifully. Thanks for sharing these-Claydon is near to us so I think we will go to have a look. 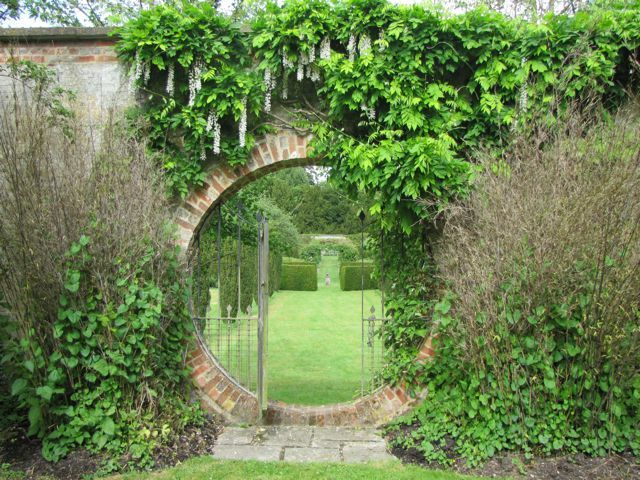 We have a moongate entrance to our Rose Garden at Blithewold and as I understand it, it was designed to be just low enough to make a person feel like ducking to get through it - we bow before entering the garden. Thank you for this Kris - I was told by another blogger that you have a moongate at Blithewolde and hope to get to see it for myself one day. These moongate shots are just awesome ! Love your header too ! These moongates are irresistable. One just must walk through or at least peek through them. Moongates! I never knew their name but now I will be more on the lookout for them. Very cool! I love moongates! I wish we had room for one! I love the top garden.. Thanks fot the i fo and great photo's. Quatre Vents at La Malbaie in Quebec has moon bridges. I'm not sure whether it will continue to open to the public since Frank Cabot died this year, but if the family does continue, the gardens are absolutely worth a trip if you're in eastern Canada.